Going to dine at Blue Corn Cafe? Check out the full menu for Blue Corn Cafe. When available, we provide pictures, dish ratings, and descriptions of each menu item and its price. Use this menu information as a guideline, but please be aware that over time, prices and menu items may change without being reported to our site. served with crisp blue and white corn chips. made fresh daily. served with blue and white corn chips & salsa. spicy homemade melted cheese served with blue and white corn chips. flame roasted salsa, queso and guacamole served with blue and white corn chips. crisp corn chips topped with refried pinto beans, jalapeños, cheese and tomatoes. served with sour cream, salsa, and guacamole. cheese, chile and your choice of grilled chicken, ground beef, shrimp or portobello mushrooms baked between flour tortillas. served with sour cream, flame roasted salsa and guacamole. blue crab in spicy molten cheese with crisp flour tortilla wedges for dipping. choose hot sauce, honey-chipotle or traditional bbq. served with celery and blue cheese dressing. slow braised in atomic blonde lager and basted on the grill with a choice of honey-chipotle or traditional bbq sauce. grilled yellow corn and chipotle peppers in a cream base. a rich chicken broth full of vegetables and garnished with crispy corn tortilla strips. nder pork, potatoes and posole simmered in green chile. served with a warm flour tortilla. fresh mixed greens topped with grilled chicken, bacon, avocado, blue cheese, boiled egg and pico de gallo. crisp romaine lettuce tossed in our caesar dressing. topped with toasted pinon nuts, croutons and shaved parmesan. fresh spinach, bacon, red chile pecans, red onions, jicama, blue cheese and tomatoes. tossed in our cilantro vinaigrette dressing. fresh mixed greens, cucumber, tomatoes and tortilla strips with your choice of dressing. a flour tortilla shell filled with pinto beans and your choice of beef, chicken or calabacitas. layered with lettuce, tomatoes, cheese, sour cream, guacamole and a side of salsa. slow braised in atomic blonde lager and basted on the grill with our honey-chipotle or traditional bbq sauce. served with jicama-lime slaw and fries. cod fillets dipped in our own amber ale batter served with fries, jicama-lime slaw and homemade green chile-tartar sauce. a 7 ounce flat iron steak grilled to order and topped with roasted green chile and local organic asadero cheese. served with a cheese enchilada, pinto beans and red or green chile. ground beef, calabacitas and mashed potatoes topped with green chile and cheese baked in a skillet. a traditional native american fry bread topped with pinto beans, cheese, lettuce, tomato, sour cream, guacamole and a side dish of chile. four baby back ribs and two breaded chicken breast strips served with fries, ranch dressing and honey-chipotle bbq sauce. four cheese sauce with chopped green chile, tossed with cavatappi pasta and grilled chicken. served with garlic toast. hand-pattied ground angus served on a brioche bun. add bacon, cheddar, blue cheese, jack cheese, roasted green chile, avocado, fried egg, or guacamole $0.75 each. the #1 burger in new mexico! hand-pattied ground angus topped with chopped roasted green chile and cheddar cheese. 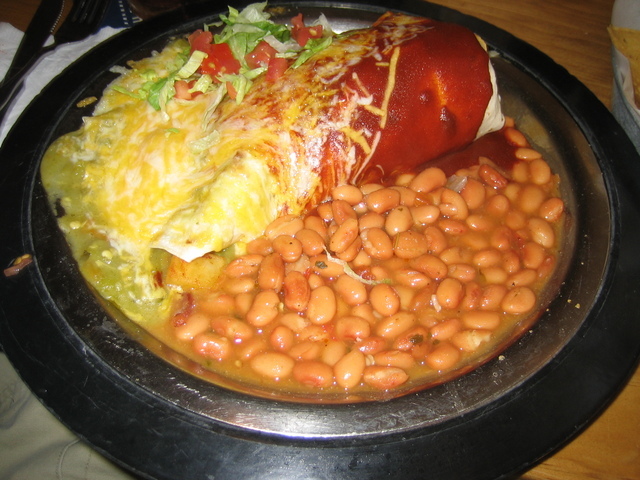 hand-pattied ground angus wrapped in a flour tortilla and smothered with red or green chile and melted cheese. a red chile blackened angus patty topped with crisp bacon and melted blue cheese. a grilled marinated chicken breast topped with peppers, onions and jack cheese. served on a brioche bun with a side of herb mayo. a grilled chicken breast basted with honey-chipotle bbq sauce then topped with caramelized onions and jack cheese. served on a brioche bun with a side of honey-chipotle sauce. three enchiladas smothered with chile and cheese. a large tortilla rolled with refried pinto beans and cheese. smothered with chile and melted cheese. tender chunks of pork marinated in red chile and slow cooked. covered with melted cheese and served with flour tortillas. three homemade blue corn shells filled with ground beef or chicken and garnished with lettuce, cheese and tomato. served with flame roasted salsa. choose two red chile pork or green chile cheese tamales topped with chile and cheese. two crispy beer battered anaheim chiles stuffed with asadero cheese and baked piping hot with chile and cheese. two yellow corn shells filled with refried pinto beans and choice of chicken, beef or calabacitas. topped with cheese, chile, lettuce, tomato, sour cream and guacamole. a sopaipilla stuffed with pinto beans, cheese and chile. cheese and your choice of chicken or beef wrapped in a flour tortilla and deep-fried. served with sides of sour cream, guacamole and chile. Our Fajitas Are Served Sizzling With Grilled Onions And Bell Peppers, Warm Flour Tortillas, Flame Roasted Salsa, Sour Cream, Guacamole And Cheese. topped with red chile caramel sauce and served with vanilla bean ice cream. light custard with caramel sauce. molten chocolate bundt cake topped with hot fudge, vanilla ice cream and walnuts. homemade root beer served in a frosty mug with a large scoop of vanilla ice cream. creamy marble cheesecake deep fried in a flour tortilla and rolled in cinnamon sugar. Fresh scrambled wggs, bacon, cheese and home fries wrapped in a large flour tortilla. Topped with cheese and chile and served with pinto beans. 1/2 grilled chicken wrap and a cup of soup. Tender baby back ribs basted on the grill with our honey-chipotle BBQ sauce or traditional BBQ sauce. Served with jicama-lime slaw and fries. A red chile blackened 1/2 lb. burger topped with crisp bacon and blue cheese. Three crispy blue corn taco shells filled with ground beef or chicken and garnished with lettuce, cheese and tomatoes. Served with flame roasted salsa. 1/2 pound burger served on a sourdough roll. Add bacon, cheddar, blue cheese, green chile or guacamole $.50 each. A 10-ounce strip steak grilled with a dash of seasoning. Served with mashed potatoes and calabacitas. A large tortilla stuffed with refried black beans and cheese, then smothered with chile. Our fresh mixed greens house salad with your choice of dressing. Tender pork cubes marinated in red chile and slow cooked. Covered with melted cheese and served with flour tortillas. Salmon fillet baked on a cedar plank for flavor. Served with calabacitas and mashed potatoes. Two yellow corn shells filled with black beans and choice of chicken, ground beef or calabacitas then topped with cheese, chile, lettuce, tomato, sour cream and guacamole. Golden fries smothered with cheese, ground beef and spicy Chimayo red or Hatch green chile. Two crispy-battered long green chiles stuffed with jack cheese and baked piping hot with chile and cheese. Cheese and your choice of chicken or ground beef wrapped in a flour tortilla and deep-fired. Served with sides of sour cream, cuacamole and chile. Try all of our popular dips - Flame Rooasted Salsa, Queso and Guacamole served with a never-ending basket of crisp blue and white chips. Blue Crab in spicy molten cheese with crisp flour tortillas wedges for dipping. Tortilla shell filled with pinto beans and your choice of beef, chicken or calabacitas. Layered with lettuce, tomatoes, cheese, sour cream, guacamole and a side of salsa. Menuism intends to provide the most accurate information possible. The Blue Corn Cafe menu items have been provided by Menuism users or third party data sources. If you see discrepancies or you represent Blue Corn Cafe and wish to report changes, please contact us. "Blue Corn Cafe is a nice restaurant located near the main plaza of Santa Fe. They are apparently..."